I originally thought the Kristlemas Special Bar would be a limited edition made specifically for the Kristlemas Market. However, I like it so much that I am not sure if it should make encore appearances! In any case, it will be a while before my next pop up market. I am sure I will have other brand new ideas to share! Before I forget, here is the recipe for Kristlemas Special Bar. You know, just in case I never make this again and you want to re-create the experience at home. Line a 9x13-inch cake pan with parchment paper. In the bowl of a food processor, pulse hazelnuts with 150g sugar until finely ground but still crumbly. Do not over-process or you will end up with hazelnut butter. Add salt, flour, cinnamon, and allspice. Pulse about 6 times until combined. Scatter cold butter pieces and pulse until mixture looks like wet sand. Tip the shortbread dough crumb into prepared cake pan to an even layer. Cover with parchment paper and press with a second cake pan until compact. Chill in fridge for 30 minutes. Preheat oven to 350F. Bake shortbread base for about 30-35 minutes until top feels dry and lightly browned. Leave to cool completely. 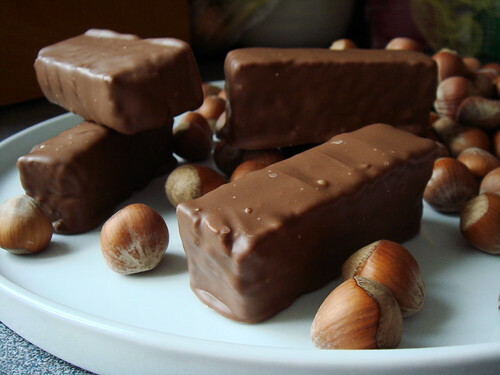 To make the Nutella nougat, combine 550g granulated sugar and 187g water in a 2qt sauce pan and bring to boil. Insert candy thermometer. Turn heat down to medium high and cook undisturbed. In the mean time, warm Nutella in a medium bowl at 15 second bursts in the microwave until it turns fluid. Set aside. Once the syrup reaches 240F, whip egg whites in the bowl of a stand mixer at high speed until it reaches soft peaks. Cook syrup to 255F and remove from heat immediately. With the mixer running on medium low, slowly pour syrup in thin stream into whipped egg whites. Try to land that spot between the whip attachment and the side of bowl. Once all the syrup is incorporated, whip at high speed for 10 minutes until meringue is warm to touch. Pour meringue into a large mixing bowl and fold in warm Nutella and fleur de sel quickly using wide sweeping strokes. 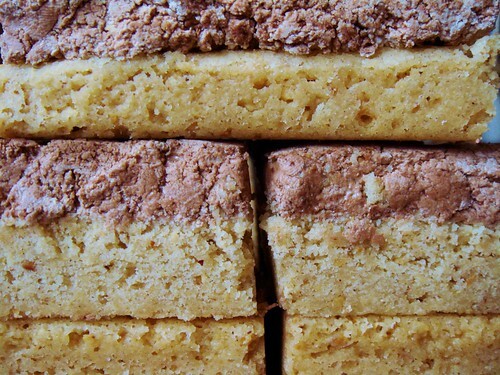 When you no longer see streaks of Nutella, the mixture would start to seize and you need to spread it to an even layer on top of the shortbread base immediately. The nougat may seem crumbly but you can gently press it together if you cover it with a piece of parchment paper. Leave to set overnight. Unmold the slab of nougat shortbread on top of a cutting board covered with parchment paper. With the shortbread side facing up, you can gently cut the slab using a serrated knife. I use a sawing motion to cut through the shortbread before pressing down to cut the nougat. Temper milk chocolate and enrobe all the bars using a dipping fork.